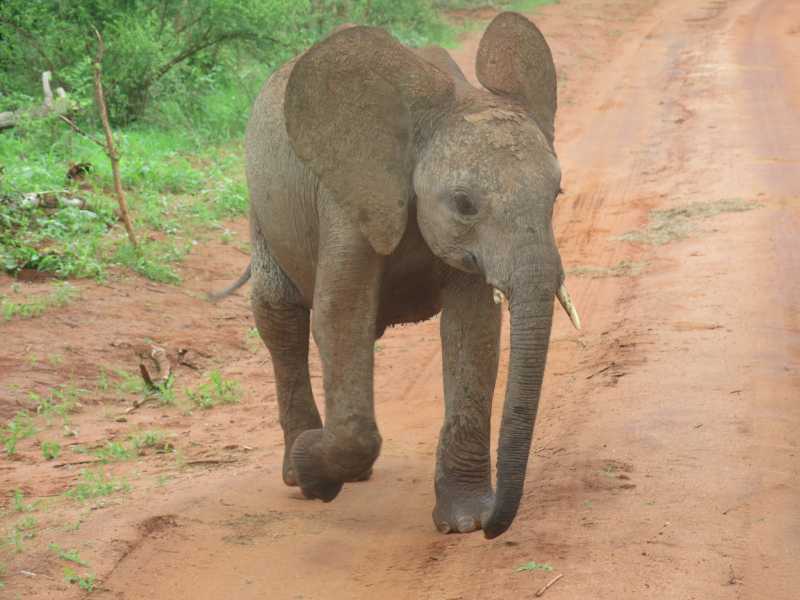 The David Sheldrick Wildlife Trust is the most successful orphan-elephant rescue and rehabilitation program in the world and one of the pioneering organisations for wildlife and habitat protection in East Africa. Founded in 1977 by Dr. Dame Daphne Sheldrick, in honour of the memory of her late husband, famous naturalist and founding Warden of Kenya’s Tsavo East National Park, David Leslie William Sheldrick, the DSWT claims a rich and deeply rooted family history in wildlife and conservation. 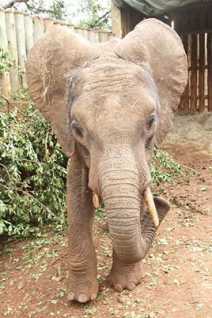 At 10.30pm on the 17th of September 2013, a young elephant was brought to the Trust’s elephant nursery by the Kenya Wildlife Service. He had been recently spotted alone without a herd and deep in community lands on the slopes of Mount Kenya. A number of rescue attempts had been made by KWS over the previous weeks, but the elephant kept disappearing deep into the forest and proved impossible to catch. 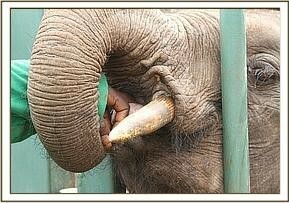 The elephant was huge, approximately between 3 – 5 years old and had a damaged tusk. Things became desperate when the community threatened to kill the elephant if KWS did not remove it from their cultivated lands, and so the KWS/David Sheldrick Wildlife Trust were called to the scene. After a lengthy wait they managed to locate the elephant, anesthetized him, and then loaded him onto the back of the KWS Land Cruiser. 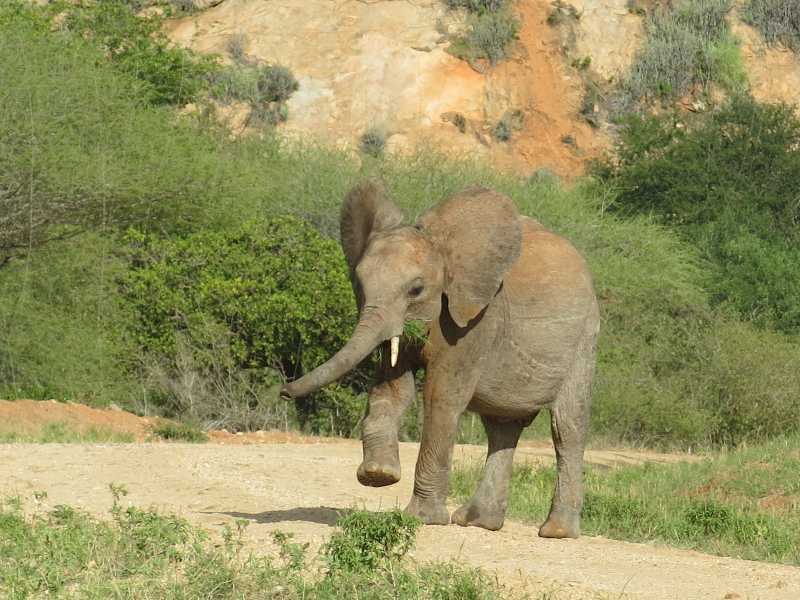 He was revived although remaining strapped and recumbent in the vehicle before the long journey to the David Sheldrick Wildlife Trust Nursery. This was a journey that took them close on four hours and was undertaken at night. 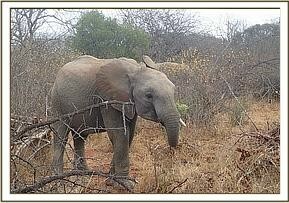 It had been an extremely challenging rescue, particularly given the location and the size of the elephant. The unexpected night time arrival of yet another elephant at the Nursery had everybody scratching their heads and off-loading him was challenging to say the least. Between the keepers and the rangers, a plan was made. While the rescued elephant lay recumbent in the back of the vehicle he was injected with antibiotics and also a tranquilizer to take the edge off his aggression. With team work and enormous effort he was offloaded onto a canvas stretcher and lifted by 15 men and carried into the stockade. His restraining straps were removed and everybody fled for their lives scrambling out of the stockade before he could get to his feet. The following day was very stressful for all concerned. With the tranquilizer drug now worn off he became extremely aggressive, but remained feeding well, getting through incredible amounts of vegetation that constantly had to be replenished. He was given the name Bongo – synonymous with Mount Kenya, as well as being a very African name. The Trust felt that his chances at a new life and family were best placed through the Nursery and the Rehabilitation Program. His stay in the stockades will be a lengthy one because he needs to be tamed sufficiently so that he can be safely transported to one of the two Relocation Units in Tsavo. Towards the end of November we made a decision that our club should foster Bongo the Elephant and within a very short space of time we had raised over £700. See our fund raising page at www.justgiving.com/BongoFury. Bongo will require first class care for many years to come, but with our support he can one day enjoy a life back in the wild. Pictured: Bongo browsing the undergrowth. We have received an update from Bongo’s dedicated keeper. In February a small party of ex-orphans returned to the stockade to see what was going on. In the afternoon, the Ex Orphans briefly joined the juniors and made away with Narok and Bongo off into the Park! The keepers realized later that the two had been snatched by the Ex Orphans and they tracked their footprints until dark but to no avail. Later when it was just after dark, Narok and Bongo returned back to the stockade after spending half the night out. Only time will tell if the experience they had was a nice one or if they decide they need more time to be with their human family! At some point Bongo will want to return to the wild, but it’s too early for that yet. We have extended the fostering programme for another 2 years. This cost $100 US (about £70). If you would like to make a donation to top this up even further then please go to our dedicated “Just Giving” page. We don’t know Bongo’s age for certain, but he’s probably about six now and has been in the unit nearly 3 years, but he’s acting tough and is not daunted by the visiting wild bull elephants at the mud hole. It’s very hot in the bush this time of year, and when the bulls appear in the morning for their water and roll-around, the other young elephants give them plenty of space and sit in the shade until they have gone. But not Bongo! He dives straight in; he’s the small one with his back to us in the photo above. Another year goes by and Bongo is still being a bit naughty. Recently he acquired a new (younger) friend. The month began with truants Bongo and Kanjoro missing from the dependent group when it was time to return home for the evening. Following a long search, the Keepers decided to return to the stockades without them due to the late hour. In the middle of the night both returned escorted back by ex-orphan, big boy Rapsu. At day break there they were, patiently waiting for their morning milk feed. 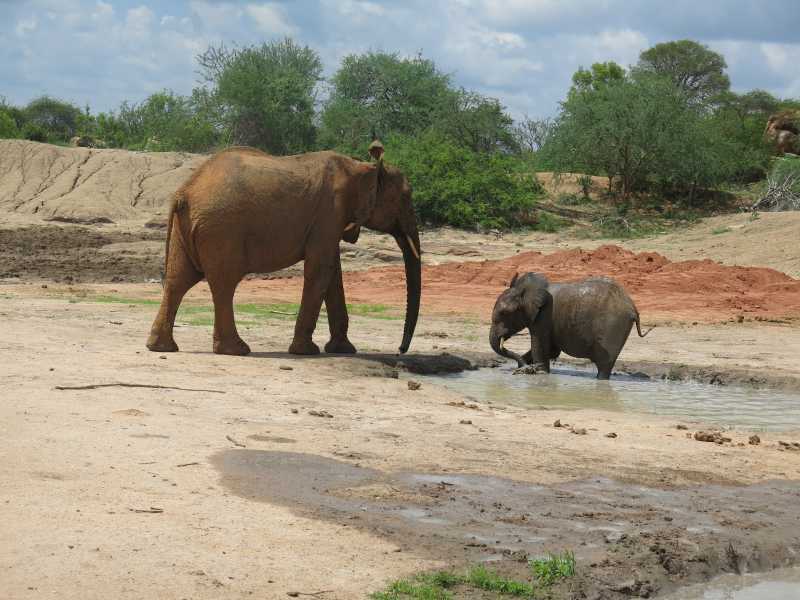 “Ithumba has been transformed after the rains with the orphans’ waterhole now full of rain water enabling the orphans to swim, totally submerged which they love. The dependent babies which consist of Bongo, Bomani, Garzi, Kandecha, Kanjoro, Kasigau, Kainuk, Kilibasi, Laragai, Makireti, Mutara, Narok, Orwa, Shukuru, Sities, Teleki, Turkwel and wonderfully friendly little Vuria, are joined most days by the ex orphans and interestingly enough many wild friends who have chosen to remain in the area despite the rains. This is unusual with the bountiful food throughout the region and with every waterhole filled. Just in! These are the latest photos from Kenya. Here he is, running away again! Thanks to everyone at the Bongo Bash who contributed to the fund. We managed to raise another £145! Bongo has been very naughty! 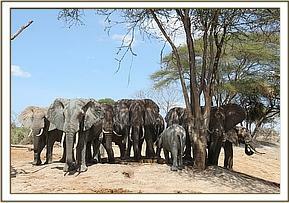 Bongo, preferring the company of the older elephants was happy to have Mulika and the ex orphans at mud bath. He even tried to sneak off with the ex orphans but the keepers spotted him and held him back. Bongo is settling down well at the Stockades with his new mates and enjoys wallowing in the local mud hole. Our fostering certificate can now be viewed online! We receive a letter from Rob Brandford, UK Director of the David Sheldrick Wildlife Trust, thanking us for our support.You can download the pdf file brandford.